Lewis Business Media produce a range of media offerings including B2B magazines targeted along the UK food chain from large scale farmers, agronomists as well as those working in agricultural merchants and country stores. We also contract publish magazines for other businesses as company or customer magazines, and annual reports. 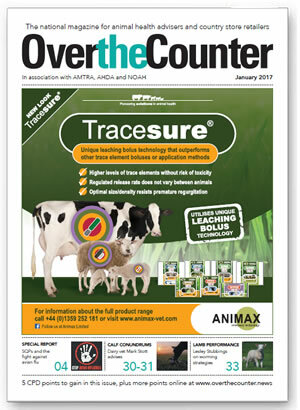 OvertheCounter is a bi-monthly magazine which targets qualified advisers in country stores and agricultural merchants. These include AMTRA qualified Suitably Qualified Persons (SQPs) as well as veterinary nurses, veterinary practices, buyers, wholesalers/distributors and marketing professionals. We provide essential guidance for these influential advisors through training and educational initiatives on the sale of products sold through these specialist retail outlets including animal health medicines and products. OvertheCounter empathises with the information needs of these qualified advisors to assist in product selection and recommendation at point of sale. We also work with key industry bodies including AMTRA, AHDA and NOAH to raise the profile of these individuals to those involved within this industry. We also organise the annual OvertheCounter Awards as well as seminars and conferences.